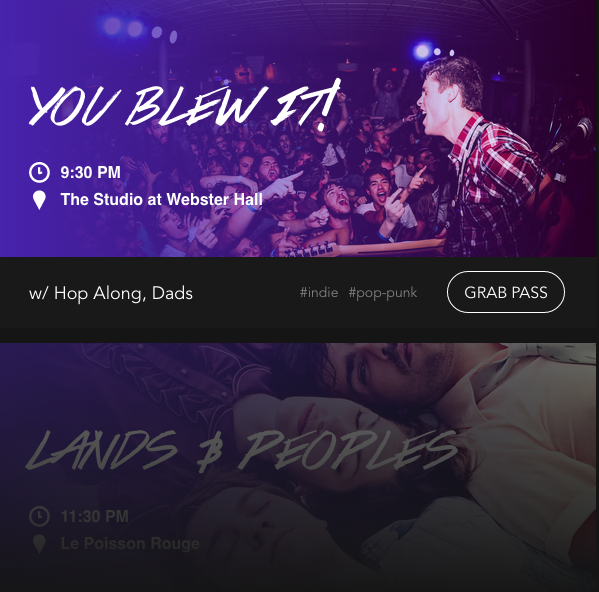 A music startup out of New York could give StubHub and other ticketing sites a run for their (proverbial) money. 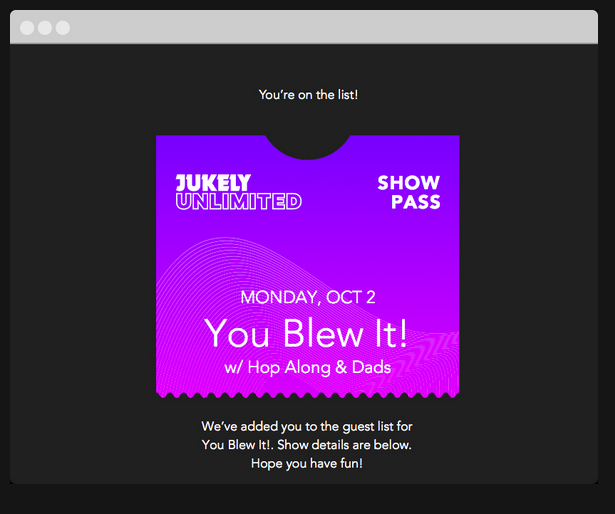 It’s called Jukely and it’s offering users an unlimited subscription to concerts in their city for just $25 a month. “We asked how much people would pay — $100? No. $50? Still too high. Then we asked if they’d pay $25 and that seemed to spark their interest,” Jukely co-founder Bora Celik explained about how his team came up with the subscription concerts price to a crowded room at the SF Music Tech Conference. Celik is a mix of an engineer and promoter. He has a background in putting together concerts including top acts such as Kaskade and DJ Tiesto. His co-founder, Andrew Cornett, designed the app and helped build Kickstarter. 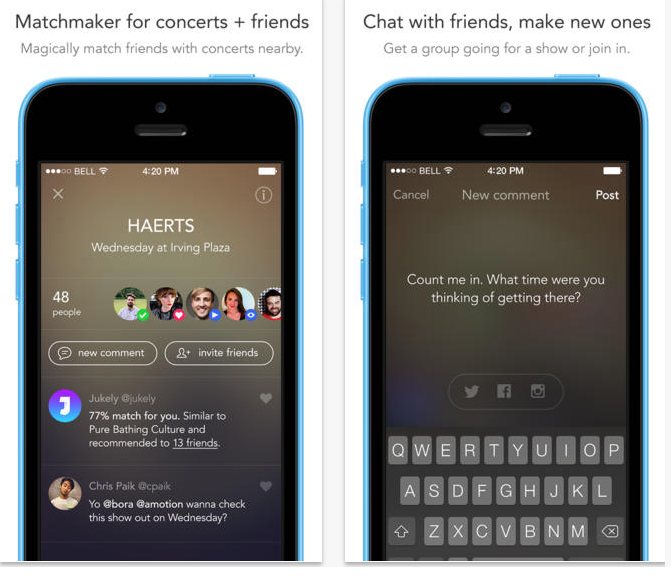 Jukely came out of the Techstars NYC 2013 accelerator program as a sort of music matchmaker. It uses an algorithm to determine your tastes, matches you up to people with the same music sense, and then suggests concerts you may want to check out together. The app now claims 30 million people and their connected friends on the platform. The startup raised a healthy seed round of $2.5 million from AngelList’s fund Maiden Lane, Amol Sarva, Northzone, Par Jorgen Parson and several other angels, including investors in Spotify and former Warner Music executive Alex Zubillaga, in early October. The cash gives Jukely the means to build the subscription service and start to spread out to other cities. A mere $25 for a la carte music concerts doesn’t seem like a good money-making model. But Celik sees the service as a win-win. He pointed out that both Jukely and concert promoters make money by filling otherwise empty ticket orders. It’s sort of like an unlimited version of ClassPass, but for music. You won’t find bigger names like Taylor Swift or Gaga on the subscription list. The idea is to fill the room and expose folks to bands that are just starting to blow up, but have enough of a presence to sell a few of their own tickets, too. Celik says his team vets the artists and adds them to a list of scheduled concerts that members can choose from. Subscription wannabes are also vetted. The service is pretty beta, which means you’ll have to sign up on the wait list and hope to get picked as an early adopter for now. Jukely is currently in 17 venues in just the New York City area for now, but we’re told there are plans to launch in LA and SF soon. TechCrunch readers in NYC can bypass the wait list and get in by clicking on this link here.